The appearance of two new, homemade signs in the alley between Red Lion Street and Bear Hill, declaring its name to be ‘Bob Hopping’ or ‘Hopping Bob’ Street, led to some debate over this and other local street names. In the 1995 Alvechurch Village Trail this road appears as Bob Hopping Street. In his book, Alvechurch: 1200 Years of History, Wilfrid English stated that “the stocks were behind the house that formerly lay next to 1 The Square before it was demolished for road widening” – that is, around the site of the memorial garden at the back of the current Dental Practice premises. Billy Brown is said to have been the last person to occupy the stocks at some time in the 1830s. 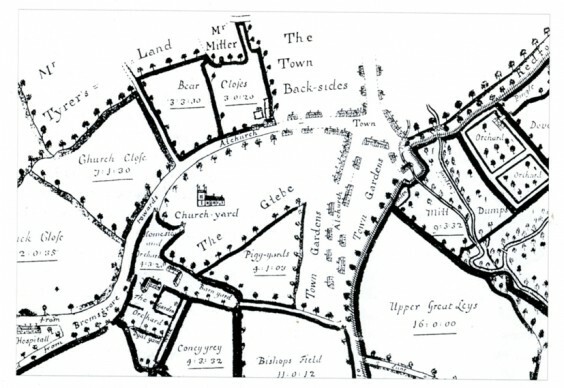 Early maps, such as one drawn by James Fish in 1701 (above), simply show roads as “road from Bromsgrove towards Alvechurch” (now Station Road and Bear Hill; “Bear” being taken from the Bear Inn, now the Old House) or “Town and Town gardens”. Maps from 1792 and 1842 are more concerned with field names and who owned or leased them. The first large-scale Ordnance Survey map of 1884 does not name roads but does name buildings. In the 1851 census, London Street was what we now know as Red Lion Street and Swan Street. The latter name was in use by 1904, though it may have been known by this name locally for much longer as there is a 1773 reference to a well or pump in the Swan Street needing repair. This is believed to be the parish well, which people had to use until piped water came to the village in the early 1900s. The houses on the elevated section of the street were known as The Newboulds, after the licensee at The Swan who owned the land and had them built. An advertisement refers to a James Huins shoe shop opening in Red Lion Street in 1906. Other names have obvious derivations: from farms – Callow Hill, Radford (or Redford in 1701); buildings – School Lane (did it have a name before 1858?) and Tanyard Lane; people – George Road after George Gee who farmed at Callow Hill, The Gaunts after a family of local doctors. Latimer Road was originally called New Station Road. The street which has changed name most often is currently known as Meadow Lane. In 1547 it was High Dog Lane, in 1714 Dog Lane, and then Rectory Road when parishioners walked to the chapel in the Rectory in what is now Old Rectory Lane for the first Sunday service. Later Ordnance Survey maps show it as New Street. Godfrey Baseley still refers to it as Dog Lane in 1972 in his book, A Village Portrait. More recent names include Dellow Grove, site of the Delson factory where Dellow cars were made; the old school site with roads named after Alvechurch Rectors mirroring the Middle School house names; and Althestan/Athelstan Close after King Athelstan, the reputed brother-in-law of Aelfgythe from whom the village gets its name. The above will show that pinning down names, dates and origins is not easy! However, Alvechurch Historical Society plans to continue researching this subject for a display at its Open Days in September 2017. Resources to be used include maps, census information 1841–1911, postcards, books, house sale particulars, trade directories, advertisements and wills. If anyone can provide additional information, please make contact via The Village magazine.